This week has been a manic one for the London based mice, I am exhausted and in desperate need of a holiday...good job that we jetted off to Dubai last night! So this week we've obviously been holiday prepping and packing and generally getting very, very excited! Other than that, the main event this week was obviously Valentine's Day. It's been a busy week of preparing special V Day blog posts in the hope of making it one to remember for our lovely readers while also trying to plan ours on the side... On the night, we ventured down to Soho House with some of our glamorous PR girls to cause some havoc...non-stop cocktail drinking for a solid 8 hours always makes for hilarious morning-after stories! Wednesday was a struggle to say the least but we made it through! Listening to James Vincent McMorrow (especially Higher Love) - just can't help repeatedly pressing play on this really pretty chill out music that gets stuck in your head. 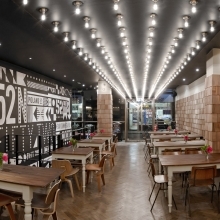 Dying to try the new 52 degrees North Bar & Kitchen in Soho. It sells itself as 'best of British' which extends not only to the all British menu with ingredients that are all sourced in the UK, but also to the beer and wine. My favourite part is that you walk in under a runaway of lights, so get prepared to strut your stuff. The bar is spread out over two floors with open fires, lots of smart wood paneling, chesterfield sofas and a general cosy but cool atmosphere. The food is supposed to be hearty and the cocktails always changing, sounds too good to be true. 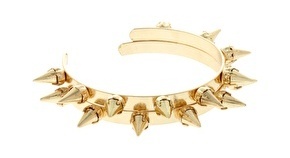 Just purchased these lush spiked bangles - I am a little obsessed by bracelets, watches, cuffs....anything to add to the stack really!I have been searching for fun new additions for my collection and these tick EVERY box - thanks Lisa for the inspiration I LOVE them! £20 for two from ASOS!